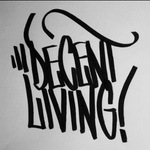 Decent Living hails from New York and got that NYC sound everyone loves. The demo is pretty rough, but still dope. The band opts for mid-tempo grooves instead of going forward with breakneck speed and there's a nice metallic feel to the songs as well. This demo has been recorded 100% DIY and gives you good example what band is capable of, but I would love to hear this songs with some better production. Download it!